Eartha Kitt sat amid the bouquets of orchids in her dressing room in London’s Shaftesbury Theatre… and cried. She cried for herself. She cried from the certainty that she will never escape the deep emotional pain that has been with her since childhood. She has been called the most exciting woman in the world, but she is also one of the saddest. “Don’t feel sorry for me,” she warns, her large dark eyes closing to slits. “Showing my weak side like this makes me feel guilty. I went around to the front of the theatre earlier and I am looking at my name on the front – my big photographs plastered everywhere. And I am thinking, that’s not little lost Eartha Mae – the child nobody wanted. white plantation owner’s son and she was brought up by a series of dirt poor relations. Eartha was beaten, starved and sent out to labour in cotton fields when she was five. She ran away from home, religion, schools, men, until one day 15-year-old Eartha was spotted dancing in the streets and asked to join a touring dance troupe. International acclaim as a dancer, actress and singer followed, but never happiness. 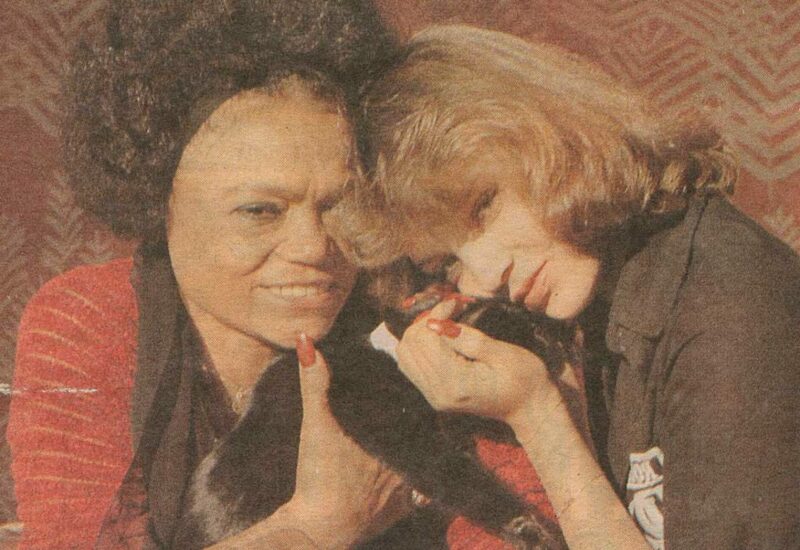 Eartha had a lot in common with her friend, Marilyn Monroe. “Marilyn used phone me in the small hours of the morning because she was fighting the same feelings as me,” she says. “Both of us were orphans. Both of us suffered from that terrible nameless fear that haunts you when normal people are sleeping. She was married for two years to property millionaire Bill McDonald. From that marriage came the most important person in Eartha’s life, her daughter Kitt McDonald, now 26. “My baby,” she sighs, shaking her head as, once again her eyes fill with tears… My baby. Worst day of my life was one-and-a-half years ago when she married. I still haven’t got over that hurt. Although the dressing room walls are hung with photographs of Eartha’s beautiful daughter, there is no evidence of her son-in-law. “He’ll have to earn my friendship baby, and that’s not going to be easy.” Scarred women are never easy. Those brutal beginnings have left Eartha with eyes like a guard dog, short-tempered impatience and a distaste for compromises. President Johnson became her enemy when she spoke out against Vietnam during a White House luncheon. A dossier compiled by the CIA resulted in Eartha not working in America for 11 years. “Nowadays my home is in Connecticut. I like being here in London,” she says. “The English know how to laugh at themselves, Americans, unless they are Jewish, have no sense of irony.” The onstage Eartha Kitt is a sequinned, slithering fantasy. Off stage, the tight, exercised body is in a red jogging suit with hair and eyes masked in scarf and glasses. She walks with weights on her arms and legs. “I never think anyone is going to recognise me when I am walking like this. But your truck drivers do! They are always shouting, ‘Hello Eartha’. What do you mean, what do I do? I wave back of course. One day I might need a job alongside them.” She was not smiling. She almost meant it.